It’ December. The race to Christmas is on! 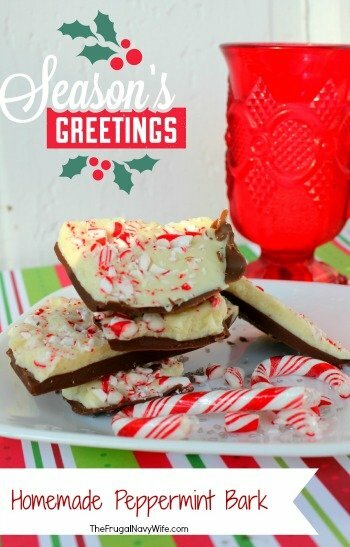 Stacy over at Adventures In Coupons and I have teamed up to bring you 12 days of Christmas Candy! Each day one of us will bring you a yummy new candy recipe! For Day 1 we have one of my all time favorites and the first candy I make each year. 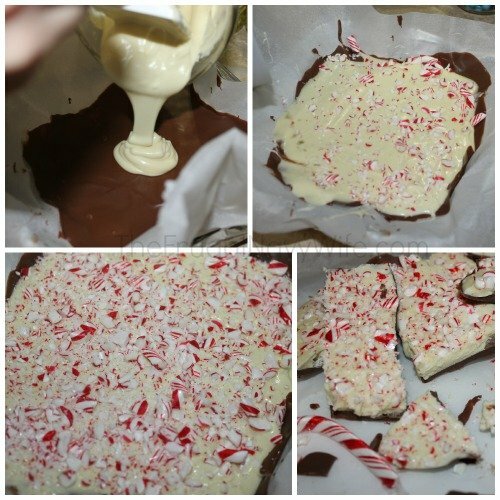 Peppermint Bark! 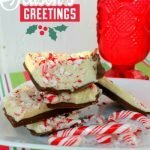 This layered peppermint bark is a delicious mix of milk chocolate, white chocolate and minty peppermint. It's beautiful in color and taste great also adding a flourish of color to your holiday table. Put some in a jar and add a bow for a beautiful and tasty gift! You may even want to make up a few extras for those unexpected guests that show up around the holidays. So yummy and very easy to do. 1) Line the bottom and sides of a 8×8 square baking pan with parchment paper. This will help you remove the bark after it hardens. 2) Melt the milk chocolate and 1 tsp vegetable oil in a double boiler or in a microwave (I'm not a fan of the microwave because I always burn it!) I used a heat safe glass bowl inside of a pot of boiling water and it worked great). Once the chocolate is melted add in 1/8 tsp vanilla extract and stir well. Pour into your 8×8 baking pan over the top of the parchment paper. Spread evenly with spatula and set into the refrigerator for about 15 minutes until chocolate becomes solid again. 4) Wash your container that you melted the chocolate in and get it ready for melting the white chocolate. Pour your white chocolate into your melting device and add in 1 1/2 tsp. vegetable oil. Melt white chocolate and again after it is melted add in 1/8 teaspoon vanilla extract. Stir well. Pour the white chocolate mixture over the top of the chocolate mixture and spread evenly. 5) Immediately sprinkle your crushed candy cane over the white chocolate and press gently so that the peppermint will settle slightly into the white chocolate and help hold it into place. Set in refrigerator to harden overnight. Enjoy!
) Line the bottom and sides of a 8x8 square baking pan with parchment paper. This will help you remove the bark after it hardens.
) Melt the milk chocolate and 1 tsp vegetable oil in a double boiler or in a microwave (I'm not a fan of the microwave because I always burn it!) I used a heat safe glass bowl inside of a pot of boiling water and it worked great). Once the chocolate is melted add in 1/8 tsp vanilla extract and stir well. Pour into your 8x8 baking pan over the top of the parchment paper. Spread evenly with spatula and set into the refrigerator for about 15 minutes until chocolate becomes solid again.
) Wash your container that you melted the chocolate in and get it ready for melting the white chocolate. Pour your white chocolate into your melting device and add in 1 1/2 tsp. vegetable oil. Melt white chocolate and again after it is melted add in 1/8 teaspoon vanilla extract. Stir well. Pour the white chocolate mixture over the top of the chocolate mixture and spread evenly.
) Immediately sprinkle your crushed candy cane over the white chocolate and press gently so that the peppermint will settle slightly into the white chocolate and help hold it into place. Set in refrigerator to harden overnight. Enjoy!